This uniquely designed 7ft. x 7ft. 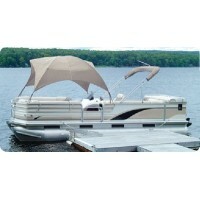 square umbrella can be used on almost any vessel from a small fis..
Top accommodates both 96" and 102" wide boats and extends out to 8 ft. of coverage. Constructed from..